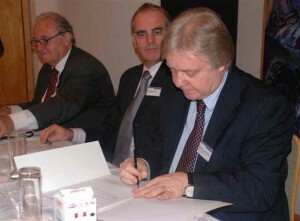 Signature of the Letter of Intent, on behalf of LIBERTAS – European Institute, by Hans-Jürgen Zahorka. From the left: Prof. Dr. Kurt Schoenherr, „father of distance teaching in Germany and founder of the first German private universities of applied sciences (left); Mr. Helmut Hauser, architect, who intends to introduce a course of intercultural architecture, based on his experience in the Balkan and in Russia; Hans-Jürgen Zahorka. POGRADEC/ALBANIA, March 2008. Pogradec is a border town in Albania, at the Southern part of the famous Ohrid Lake, directly at the border to Macedonia and 35 km from the Albanian-Greek border. In the mid of a great landscape there is the campus of Nehemia Foundation (including soon Nehemia University and a guest house), a German institution which is active in the country since the beginning of the 90s, with Swiss support. It had been launched by German evangelical church associations, delivering not only school education from kindergarten up to high school degree but also a clear value-oriented education. However, the university will be open for people from all national, religious and other backgrounds. 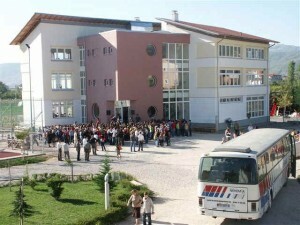 For autumn 2008, Nehemia has launched an application for accreditation for this new university. Its Rector is Dr George Sturm, originally a mathematician from Ohio State University from the USA, who taught and lives since more than a dozen years in Albania. This university – more under www.nehemia-university.org – will offer, among several other study courses and degrees, also a Master of European Studies, which has been detailed during the last weeks in intensive talks between Nehemia and LIBERTAS. This Master will be made possible as “blended learning” between self-studying learning units with control questions (altogether 25, within 16 months) and presence courses (3 x 4 days in Albania in the first year, 1 x 14 days at the end of the Master’s course). The whole course will last 18 months. There is also a virtual learning room (Moodle programme) at disposition of the students, who can come from all over the world. Among the requirements will be a project study during the 1st year and a Master thesis during the 2nd. During the final 14-day presence phase there will be also an oral examination and the award of the Masters’ degrees. The education at Nehemia is structured according to the Bologna principles – and the courses will have a certain breeze of fresh air, as students will be invited and asked to contradict, to discuss, to set up alternatives, all under the objective to get them into positive, constructive thinking. During the presence modules there will be, among others, skills on the agenda, like intercultural management and communication, like written expression or European project management, but also English as a foreign language and international negotiation simulations. The faculty for this Master will come from the whole of Europe and beyond; besides first class academicians there are seasoned professionals from European business and government structures. Precondition for registration as a student will be a Bachelor’s degree (e.g. Fachhochschule degree, other university exam etc.) or equivalent; it is recommended to ask the university beforehand if the conditions are met. At present this can be done also through LIBERTAS – European Institute under zahorka@libertas-institut.com (attn Hans-Juergen Zahorka) or +49 7471 984996-0, until further notice. The courses are starting mid-September/October 2008, and the first presence module will take place in Albania some months hereafter. In March/April 2010, the new Masters will obtain their degrees. Nehemia is a private university, and this is why students will have to pay a tuition fee which will be communicated approximately in early summer or late spring 2008. To this tuition fee, also the costs for four travels to Albania will have to be added. But the University – and also LIBERTAS – will do a lot that this will be affordable (e.g. in Germany and other EU countries the costs may be deducted from the taxable revenues, under certain conditions). There will also be several part fellowships. The University’s programme will include also conferences, workshops, and summer schools, where students will have access, and where they can get lots of international contacts. Interested persons are asked to deposit their e-mail addresses already now – they will get first-hand information at the earliest date. 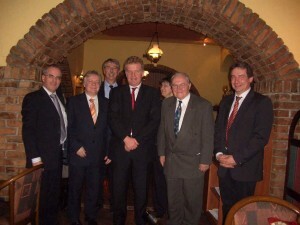 From the left: Architect Helmut Hauser (who, together with his wife Ute – 3rd from the right – has a lot of Albania experience, also from building the whole Nehemia campus, in a modern, very attractive style, perfectly adapted to the environment), Hans-Juergen Zahorka from LIBERTAS, George Sturm as Rector of Nehemia University, Minister Genç Pollo, and Prof. Kurt Schönherr (2nd from right) who signed also a Letter of Intent for the YMCA universities, as well as – at the right – Arnold Geiger, Chairman of Nehemia Foundation Council, the soul and fist behind Nehemia Foundation in Albania.